Any file with a .xml extension can be run as an Ant buildfile. Of course, not all such files really are Ant buildfiles, but no harm is done if an attempt is made to mistakenly run a non-Ant .xml file as an Ant buildfile. In this section, the basic mechanisms for running Ant buildfiles in Eclipse will be covered, using the HelloWorld.xml file created in the Editing Ant buildfiles task. 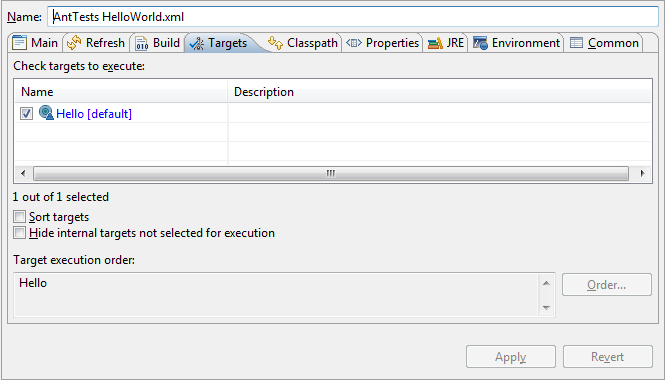 Select HelloWorld.xml in one of the navigation views and choose Run As > Ant Build... from its context menu. The launch configuration dialog is opened on a launch configuration for this Ant buildfile. This dialog allows the configuration of many aspects of the way an Ant buildfile is run, but for now concentrate on the Targets tab which allows the selection of which Ant targets to run and their order. Select both targets and leave the order as the default. The Ant buildfile is run, and the output is sent to the Console view.